Walker Percy, Fyodor Dostoevsky, and the Search for Influence. Jessica Hooten Wilson. Columbus: The Ohio State University Press, 2017. When suffering from tuberculosis and confined to a sanatorium, Percy read Dostoevsky’s Notes from the Underground which led him to question whether science could answer life’s existential questions. This experience eventually led to Percy’s conversion to Catholicism and career as a novelist. Among the many things that Percy learned from Dostoevsky, perhaps the most important was that people’s faith in the promise of science could be transformed by the power of art. 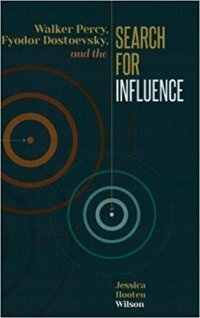 Walker Percy, Fyodor Dostoevsky, and the Search for Influence examines the relationship between Percy and Dostoevsky, with Wilson tracing the influence of Dostoevsky on the writings and life of Walker Percy. The book consists of six chapters with an introduction and conclusion. By analyzing Percy’s six published novels as well as two unpublished works, Wilson shows the impact Dostoevsky’s writings had on Percy. In each of Percy’s works, individuals struggle with alienation and question God’s existence, concerns that Dostoevsky wrestled with in his own works. After establishing the existence of the relationship between these two writers in the introduction, Wilson begins the first chapter by focusing on Percy’s two unpublished novels, The Charterhouse and The Gramercy Winner. Although he was more interested in Dostoevsky for his ideas rather than literary techniques during this period, Percy developed the alienated individual. The protagonist from the first novel feels spiritually dead, while the second starts to doubt the infallibility of science. Although both works are too preoccupied with ideas rather than characters, Percy learned from these failed attempts the “incarnational realism” of Dostoevsky: the embodiment of abstract ideas like Christ’s goodness in a particular person, time, and place. The key elements of this aesthetic that Percy would later develop and perfect are 1) the Incarnation manifested in the particularity of individual humans in the present; 2) every character confronts a predicament; 3) characters are wayfarers who are looking for a home elsewhere; and 4) the world is full of contradiction, both horror and beauty simultaneously. In the second chapter, Wilson examines the relationship between The Moviegoer and Notes from the Underground. While writing his novel, Percy realized that Dostoevsky had been the central influence on his work. Wilson demonstrates throughout this chapter how Percy remembers the works of Dostoevsky and how it shaped his own novel, The Moviegoer. Protagonists from both novels are alienated, remember events at key points in the novel, and wrestle with the question of science versus faith. Wilson also shows how The Brothers Karamzov influenced The Moviegoer with Binx resembling Alyosha more than the Underground Man at the conclusion of the novel. Chapter three explores the relationship between Percy’s The Last Gentleman and Dostoevsky’s The Idiot where Percy models his protagonist after Myshkin in the “holy fool” tradition of Russian literature. What Percy learns from Dostoevsky’s The Idiot is to make Christianity palatable to a modern audience. Wilson argues that Percy’s determination to affirm the goodness of Christianity and thereby inspire readers was the primary reason why his novel ends on a hopeful note, as opposed to Dostoevsky’s tragic one. Moving from analyzing the individual to society, Percy’s third novel, Love in the Ruins, diagnosis the spiritual sickness of twentieth-century America, as Dostoevsky had done with nineteenth-century Russia in the Demons. For Wilson, Tom More is the American Stavrogin who pursues pleasure and self-love and is representative of modern American decadent culture. More only recognizes the value of life and the salvation of religion after he attempted suicide and his love, Ellen, is threatened to be taken away. Unlike the Demons, Love in the Ruins ends with the promise of the salvation of the protagonist and social order restore, showing that Percy was influenced but was not beholden to Dostoevsky. The penultimate chapter examines Percy’s novel, Lancelot, which draws upon the themes of violence, sexuality, and a tortured conscience from Dostoevsky’s Notes from the Underground, Crime and Punishment, and The Brothers Karamazov. Wilson again shows the parallels between Percy’s novels and Dostoevsky’s works as well as illuminates Percy’s references to Dostoevsky when he was composing Lancelot. Like Dostoevsky, Percy reveals to the reader the reality of sin and evil in the world with the character Percival acting like Zossima or Alyosha to save the world one soul at a time. The final chapter looks at Percy’s fifth and sixth novels, The Second Coming and The Thanatos Syndrome, where traces of Dostoevsky still persist. In both novels, the corruption of language leads to violence, an idea that Percy gives credit to Dostoevsky. When language becomes debased so words no longer have any meaning, life loses any meaning too, allowing violence to be inflicted with impunity. Although Percy had several influences on his writings, with Kierkegaard perhaps being the best known, little has been written about Dostoevsky’s. Walker Percy, Fyodor Dostoevsky, and the Search for Influence makes a significant contribution to our understanding of Walker Percy’s writing and the influence that nineteenth-century Russian exerted on twenty-century American fiction. Rather than getting bogged down into the esoteric debates about “intextuality” and “the anxiety of influence,” Wilson shows in her accessible yet scholarly book that authors do influence each other across time and space, yielding enduring works when they humbly seek to learn from their literary predecessors. For those who want to learn more about Walker Percy–and the influence of Dostoevsky’s philosophical and religious ideas on him–Walker Percy, Fyodor Dostoevsky, and the Search for Influence is an essential book to have.